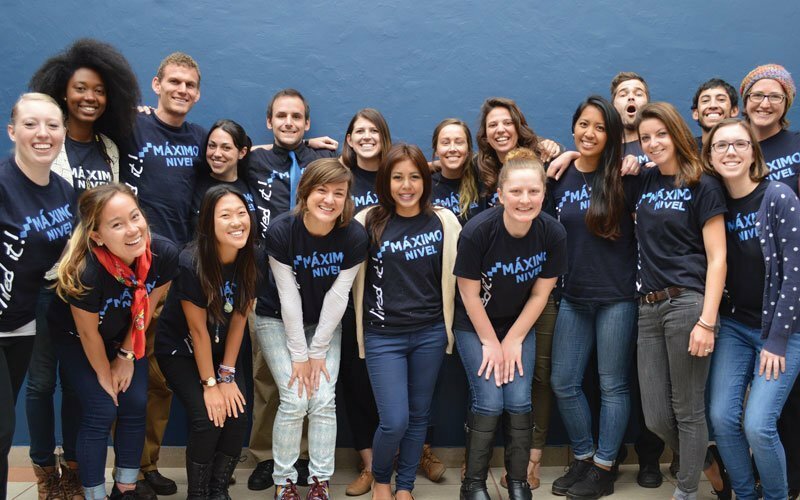 We are always looking for great people to join the Maximo Team. “Rockstar” candidates who are most successful in our organization have the following things in common: A positive mindset, organized and conscientious, great computer skills, and a love for study abroad, international education, and languages. You should also be hard working, extremely dedicated, and have a deep passion for great client service. 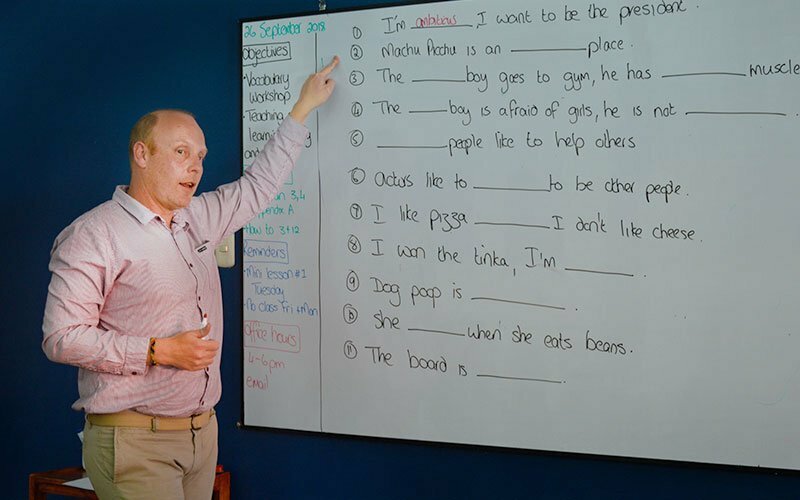 Maximo Nivel is always looking for great ESL teachers to join our teaching team in Antigua, Guatemala; Cusco, Peru; and San Jose, Costa Rica. 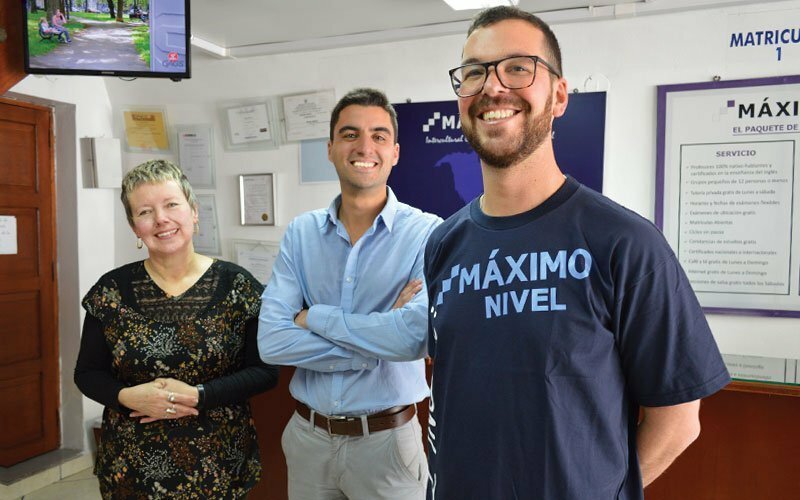 Maximo Nivel is a leading language training center and we are very well known for our “Native English Program.” The Native English Program is clearly defined by our our dedication to excellent teaching, professionalism in everything we do, and great client service. Maximo Nivel is a hard-working and professional group—and these are the kind of teachers we look for. ESL teachers teach 30 contact hours per week, Monday – Friday. Class size is strictly limited to 12 learners. Most teachers teach a range of levels from Basic to Advanced. The majority of our learners are young adults (18-30 years old) and we provide classes specifically for teenagers (12-16 years old) between 4:00PM to 5:00PM only. The minimum position duration is 6 months—we are not interested in teachers who cannot absolutely commit for at least 6 months. The Field Manager works as part of the International Programs Team—a team of 4-6 people, and reports to the Director of International Programs. The Field Manager provides in-field support, client service, and logistics to ensure service learning and study abroad programs are delivered at the highest level. The Field Manager works closely with international clients providing in-country support, project organization, class scheduling, housing, travel, and responding to any other needs that clients have. The Field Manager helps ensure that international clients are productive, happy, and safe while in-country. The Field Manager is also closely involved with partner management, including regular communication with both international and local partners. VOLUNTEER ABROAD—The Field Manager ensures that volunteers are busy and productive at their projects. The Field Manager is expected to make sure volunteers are engaged and actively working at their community service placements. The Field Manager simultaneously manages a number of social projects (15-22) and a number of volunteers (10-75). The primary goal is to provide structure and organization that results in positive impact at each project. Resources include some limited funding, volunteers, and the creativity and organizational skills the Field Manager brings to the field. The Field Manager manages these projects and provides organization, client service, encouragement, translation, and any other support required to make sure volunteers are productive at the project site. The Field Manager must develop strong, interactive relationships with the Director(s) of each project. They must work toward creating mutually beneficial relationships—ensuring that Maximo Nivel is a good partner and that Maximo Nivel’s volunteers and the project benefit from the relationship. Benefits include: improved realization of the project’s mission, improved organization, improved cleanliness, improved attendance, construction, food, supplies, improved support for the project Director and staff, etc. The Field Manager also provides orientation, client service, housing, and scheduling support for all of Maximo Nivel’s study abroad programs. VOLUNTEER PROJECT SITES—Field Managers meet with and assess project sites for suitability to host international volunteers and to work with Maximo Nivel. Suitability is determined by assessing: existing organization, existing team, need, ability and willingness to work with international volunteers, and the opportunity for Maximo Nivel and its volunteers to bring positive impact to the project. FAMILY-STAYS—Field Managers meet with and assess new host families for their suitability to provide housing and food to Maximo Nivel’s international clients. Suitability is determined by assessing motivations of the family for housing international guests, cleanliness, hospitality, number of rooms/beds, ability to provide good food and timely meals, and the family’s willingness to provide a cultural immersion experience. – Scheduling: Volunteers, Spanish classes, family-stays, etc. – Travel details: flights, hotel, arrival, departure, etc. The minimum position duration is 24 months—we are not interested in individuals who cannot absolutely commit for at least 2 years. The Director of National Programs leads the Native English Program in either San Jose, Costa Rica; Antigua, Guatemala; or Cusco, Peru. This person is responsible for sales, marketing, client service, enrollment, placement testing, and class scheduling. A major component of this position is managing the front office (‘the store’) and the logistics of opening, closing, cashing out, and selling ESL classes. It’s also important to generate excitement, both within the staff and the client base, about providing great client service and meeting matriculation goals each month! The Director works 1-on-1 with individuals to matriculate them into Maximo’s Native English Program. The Director also works with B2B clients to sell our English programs to tourism operators, hotels, banks, and other businesses. The Director of National Programs works very closely with the Academic Director in terms of providing great service to students and clients, scheduling classes, and maximizing enrollment. The Director manages a shared team of 3-5 client service representatives, and also provides management support to the Academic Director who leads a team of approximately 25 ESL teachers. The minimum position duration is 24 months—we are not interested in candidates who cannot absolutely commit for at least 2 years. The Academic Director manages all daily operations of the Academic Office. The Academic Director is the lead manager for all teachers and all academic programs at Maximo Nivel. This includes the Native English Program, Spanish Immersion, TEFL Certification, Service Learning, Internships, and all other study abroad programs. The Academic Team provides support for all other areas of Maximo Nivel in terms of books, materials, exams, quizzes, photocopies, and rooms. The Director is responsible for a team of 2 to 4 [shared] staff members, 10 to 25 English teachers, and 5 to 15 Spanish teachers. The size of the staff depends on the institute location—Costa Rica, Guatemala, or Peru. The Director is responsible for teacher recruiting, teacher management, curriculum management, support materials, and quiz and exam administration. The Academic Director also leads all new teacher orientation and onboarding of academic staff. Teacher management includes coaching, scheduling, payroll, and time off, among other things. The Director is responsible for holding teacher meetings on the 15th and 30th of each month; and organizes 2 hours of in-service training for English and Spanish teachers every month. The Academic Team manages client service with respect to exam re-takes, grade reports, certification requirements, and attendance records. The Academic Office has very close contact with learners, clients, and their families; the Academic Director must be excellent at dealing with the public! The Academic Director is a member of the in-country Executive Team and works closely with the Country Manager, Director of International Programs, and the Director of National Programs. Whereas the Academic Director does not carry his/her own schedule of classes, they are responsible for substituting and leading classes when regular staffing does not meet the needs of the institute. The Director must generate reports using Excel and Word including: Teacher Feedback Summary, Teacher sick days, Teacher payroll, and other ad-hoc reports as needed. – Excellent computer skills including Word, Excel, PowerPoint, etc. – Focused on results—learner success, learner satisfaction, and building an excellent teaching team. Be the owner of the Academic function! – Adept at setting goals and managing competing priorities. 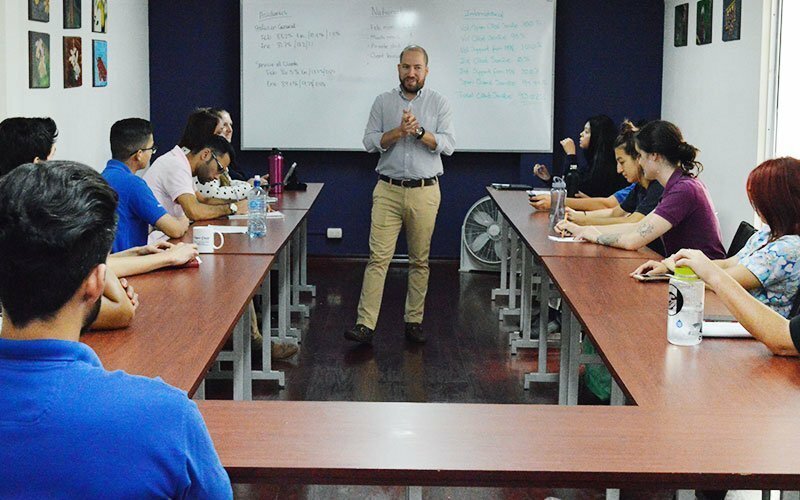 The TEFL Trainer is responsible for teaching and managing Maximo Nivel’s internationally-accredited TEFL Certification program. This position is based in one of 3 locations: Antigua, Guatemala; Cusco, Peru; or Manuel Antonio, Costa Rica. The TEFL Trainer is responsible for delivering the TEFL Certification program including the onsite (4 week course), the Hybrid TEFL course, and the online TEFL course. The Trainer often needs to balance training in all 3 modalities each month. The TEFL course is fully-developed and the program has been functioning on a monthly basis since 2004. The course is offered 11 months per year—mid-January through mid-December. The primary goal of the course is to train new ESL teachers, who will accept teaching positions with language schools and institutes around the world. Maximo Nivel’s TEFL Certification course is well-known and is exceptionally well-reviewed by past participants. Maximo’s TEFL Certification program is known for being 1) intensive and demanding, 2) fun and entertaining, and 3) very supportive. The TEFL Trainer is expected to maintain these high standards! The TEFL Trainer leads the certification course on a daily basis, grades papers, and manages participant scheduling onsite and online. The Trainer provides coaching and feedback to trainees—this is the most important part of the position. Trainers also provide feedback and coaching on résumés/CVs and job-finding. 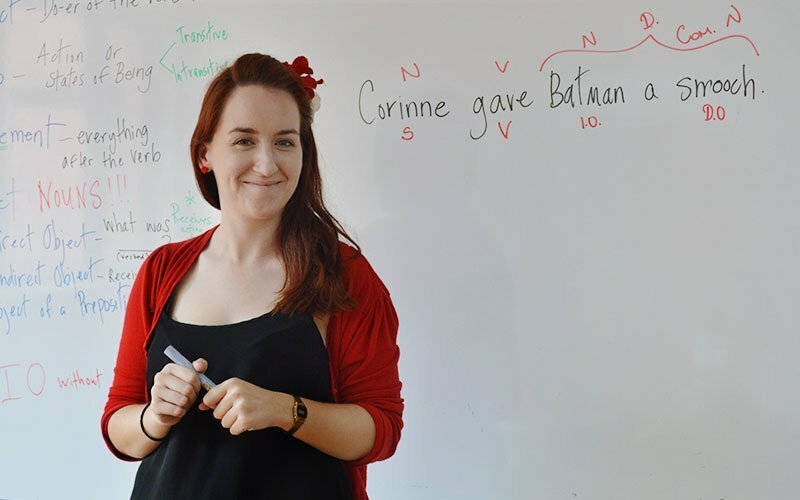 For the onsite course, the TEFL Trainer works Monday-Friday from 8:00AM to 6:00PM. The first 3 weeks of the course are easier as no long evening hours are required other than regular course management and required office hours. During the final [4th] week of the course, the Trainer must also work in the evening to observe and evaluate trainees. Note that this often requires 12 – 14 hours per day. For the online TEFL course, the TEFL Trainer schedules online meetings with participants on a regular and as-needed basis. The exact schedule is determined by each TEFL client. The TEFL Trainer simultaneously manages both onsite and online courses and this requires excellent scheduling and priority-setting from the TEFL Trainer.